The web of the 187 3⁄16 miles long underground lines entangles almost all the city. The old stations have land pavilions. Arbatskaya Station of the Filyovskaya Line. First of all you have to get a ticket at the KACCA ['kα:sə]. You may also get a multi-ride card. Thus each trip would be cheaper. 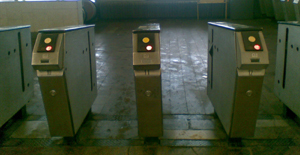 Then you should put the ticket to the yellow circle of the right-handed validator, and when the green light the green light display the number of remaining trips, you may go through the automatic gates. The most of the stations are deeply underground. Therefore the passangers are moved to the platform (the underground part of the station) by the escalators, those can move large numbers of people up and down. 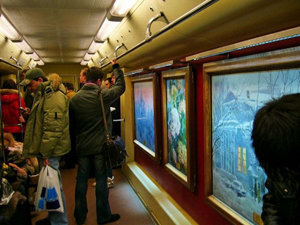 Moscow Metro is the most beautiful subway in the World. The Mayakovskaya Station. Some central stations are decorated with bronze sculptures. 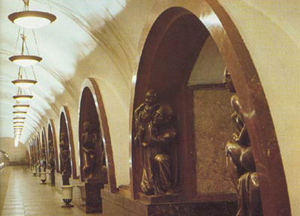 These sculptures in the archway at the Ploshchad Revolyutsii Station depict the people of the Soviet Union. The Rimskaya Station is named after Antient Rome to remind that Mocow is the successor of the Roman Empire (Moscow is Third Rome). After the the Fall of Constantinople to Mehmed II of the Ottoman Empire on 29 May 1453, Ivan III, Grand Duke of Moscow, who had married Sophia Paleologue, a niece of Constantine XI, the last Eastern Roman Emperor, declared: "Two Romes have fallen. The third stands. And there will be no fourth." 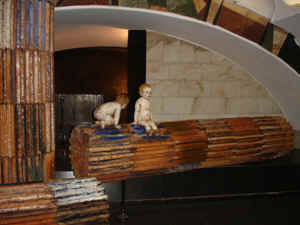 The station is decorated with typical Roman columns and a child sculpture of Romulus and Remus in the far end of the central hall. People are waiting for the train. The trains arrive every 90 seconds during rush hours. The Moscow Metro passangers manage to read while standing. Those, who are not sleeping are reading. Those, who are not reading are sleeping. 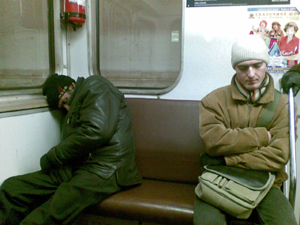 The contemporary passangers read and sleep more than the passengers of the Soviet period. 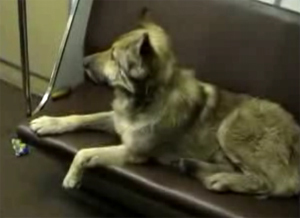 Moscow stray dogs also travel by Metro. Vykhino is the last station in Moscow to be built above ground, and the last to have side platforms. The best way to move from any Moscow district to another one is to use the Moscow Metro, which spans almost the entire Russian capital, is the world's second most heavily used metro system. Opened in 1935, it is well known for the ornate design of many of its stations, which contain outstanding examples of socialist realist art. Today, the Moscow Metro contains 298.8 km (187 3⁄16 miles) of route length, twelve lines, mostly underground with a total of 180 stations. 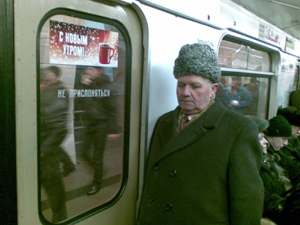 The Moscow Metro is a state-owned enterprise. On a normal weekday the metro carries over 7 million passengers. Passenger traffic is considerably lower on weekends bringing the average daily passenger traffic during the year to 6.8 million passengers per day. The Metro is one of the deepest subway systems in the world; for instance the Park Pobedy station, completed in 2003, at 84 metres (280 ft) underground, has the longest escalators in Europe. The first plans for metro system in Moscow date back in the times of the Russian Empire, but they were postponed by World War I, the October Revolution and the Russian Civil War. It was not until June 1931 that the decision to start construction of the Moscow Metro was taken by the Central Committee of the USSR Communist Party. The first lines were built under the 1930s Moscow general plan designed by Lazar Kaganovich, and the Metro was initially (until 1955) named after him ("Metropoliten im. L.M. Kaganovicha"). Advice was given by the London Underground, the world's oldest metro system (partly because of this connection Gants Hill tube station, although not completed until much later, is reminiscent in design of many stations on the Moscow Metro). The first line was opened to public on May 15, 1935 at 7am. The line was 11 km long, and included 13 stations. It connected Sokolniki to Park Kultury with a branch from Okhotny Ryad to Smolenskaya. The latter branch was further extended westwards to the new station Kiyevskaya in March 1937 (making the first Metro crossing of the Moskva River by the Smolensky Metro Bridge). The construction of the first stations was based on other underground systems, and only a few original designs were allowed: (Krasniye Vorota, Okhotniy Ryad and Kropotkinskaya). Kiyevskaya station was the first to use national motifs. On May 14, 1935, the Komsomol was awarded the Order of Lenin by Stalin's suggestion for the contribution of the Komsomol members to construction of the first Metro stage. 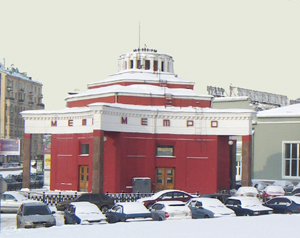 Smolenskaya was one of the first station to be opened on May 15, 1935. It was the terminal station of the first stage. Two years later the land pavilion was demolited in the framework of the expansion of Garden Ring. The second stage was completed before the war. 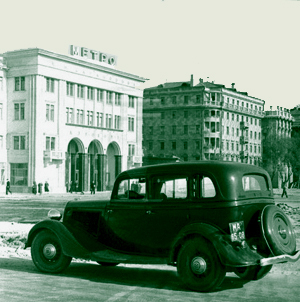 In March 1938 the Arbatskaya branch was split in two and extended to Kurskaya station (now the dark-blue Arbatsko-Pokrovskaya Line). 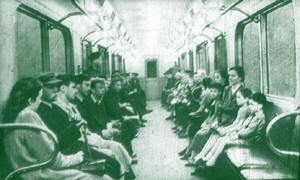 In September 1938 the Gorkovskaya Line opened between Sokol and Teatralnaya. Here the architecture was based on the most popular of the stations already in existence (Krasniye Vorota, Okhotnyi Ryad and Kropotkinskaya) and the compositions followed the popular art deco style, though merging it with socialist visions. The first deep level Column station Mayakovskaya was built at the same time. Building work on the third stage was delayed but not interrupted during World War II, and two Metro sections were put into service: Teatralnaya - Avtozavodskaya (3 stations, crossing the Moskva river in a deep tunnel) and Kurskaya - Partizanskaya (4 stations) were inaugurated in 1943 and 1944 respectively. War motifs replaced socialist visions in the architectural design of the stations. 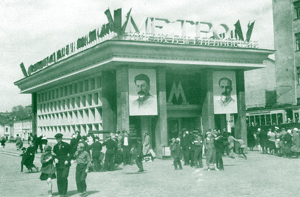 During the Siege of Moscow, in the autumn and winter of 1941, metro stations were used as air-raid shelters and the Council of Ministers moved its offices to the platforms of Mayakovskaya, where Stalin made public speeches on several occasions. Chistiye Prudy station was also walled off and the headquarters of the Air Defence installed there. 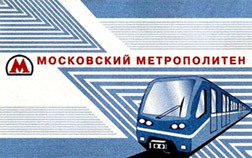 After the war, construction started on the fourth stage of the Metro, which included the Koltsevaya Line and a deep part of the Arbatsko-Pokrovskaya line from Ploshchad Revolyutsii to Kievskaya, and a surface extension to Pervomaiskaya in the early 1950s. The exquisite decoration and design of so much of the Moscow Metro is considered to have reached its peak in these stations. The Koltsevaya Line was planned first as a line running under the Sadovoye Koltso (Garden Ring), a wide avenue encircling the borders of Moscow's city centre. 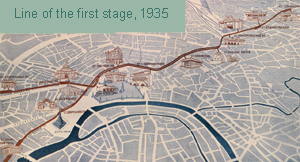 The first part of the line - from Park Kultury to Kurskaya (1950) - follows this avenue. But later plans were changed and the northern part of the ring line deviates 1-1.5 km outside the Sadovoye Koltso, thus providing service for 7 (out of 9) rail terminals. The next part of the Koltsevaya line opened in 1952 (Kurskaya - Belorusskaya) and in 1954 the ring line was completed. There is an interesting urban legend about the origin of the ring line. A group of engineers approached Stalin with plans for the Metro, to inform him of current progress and of what was being done at that moment. As he looked at the drawings, Stalin poured himself some coffee and spilt a small amount over the edge of the cup. When he was asked whether or not he liked the project so far, he put his cup down on the centre of the Metro blueprints and left in silence. The bottom of the cup left a brown circle on the drawings. The planners looked at it and realized that it was exactly what they had been missing. Taking it as a sign of Stalin's genius, they gave orders for the building of the ring line, which on the plans was always printed in brown. This legend, of course, may be attributed to Stalin's cult of personality. 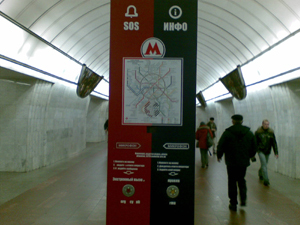 In fact the line was never shown as a circle on the Metro map until 1980, long after Stalin's death. Prior to this time, the line was depicted much closer to the shape of the actual route. In fact, fare became much larger after the monetery reform of 1947. All the magnificence of the most beautiful Metro in the World has been constructed manually by the Red Army sodiers and the Gulag prisoners, including women. 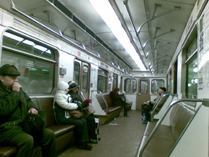 Interior of the Metro trains has almost no changes since 1930s. The beginning of the Cold War led to the construction of a deep part of the Arbatsko-Pokrovskaya Line. The stations on this line are very deep and were planned as shelters in the event of nuclear war. After finishing the line in 1953, the upper tracks between Ploshchad Revolyutsii and Kiyevskaya were closed and later reopened in 1958 as a part of the Filyovskaya Line. 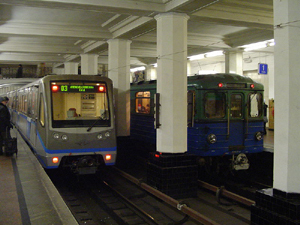 In the further development of the Metro, the term "stages" was not used any more, although sometimes the stations opened in 1957вЂ“1959 are referred to as the "fifth stage". During the late 1950s, the architectural extravagance of new metro stations was significantly toned down, and decorations at some stations, like VDNKh and Alexeyevskaya, were greatly simplified compared with original plans. This was done on the orders of Nikita Khrushchev, who favoured a more spartan decoration scheme. 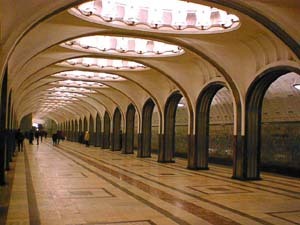 A typical layout (which quickly became known as "Sorokonozhka" - "Centipede", which comes from the fact that early designs had 40 concrete columns in two rows) was developed for all new stations, and the stations were built to look almost identical, differing from each other only in colours of the marble and ceramic tiles. Most of these stations were built with simplified, cheaper technologies which were not always quite suitable and resulted in extremely utilitarian design. For example, walls paved with cheap and simplistic ceramic tiles proved to be susceptible to vibrations caused by trains, with some tiles eventually falling off. It was not always possible to replace the missing tiles with the ones of the same color, which eventually led to infamous "variegated" parts of the paving. Not until the mid-1970s was the architectural extravagance restored, and original designs once again became popular. However, newer design of "centipede" stations, with 26 columns with wider ranges between them and more sophisticated, continued to dominate. Time evolution of the number of stations.Since the turn of the century, several projects have been completed, and more are underway. The first one was the Annino-Butovo extension, which consisted of extending the Serpukhovsko-Timiryazevskaya Line from Prazhskaya to Ulitsa Akademika Yangelya (2000), Annino (2001) and Bulvar Dmitriya Donskogo (2002). 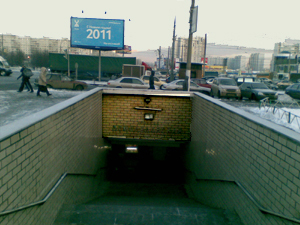 Afterwards a new elevated Butovskaya Light Metro Line was inaugurated in 2003. Another major project was the reconstruction of the Vorobyovy Gory station, which initially opened in 1959 was forced to close in 1983 after the concrete used to build the bridge turned out to be defective. After many years, the station was rebuilt and re-opened in 2002. A more recent major project included building a branch off the Filyovskaya Line to the Moscow International Business Centre. This included Delovoy Tsentr (2005) and Mezhdunarodnaya, opened in 2006. After many years of building the long-awaited Lyublinskaya Line extension was inaugurated with Trubnaya in August 2007, with Sretensky Bulvar in December of that year. The major Strogino-Mitino extension began with Park Pobedy in 2003. 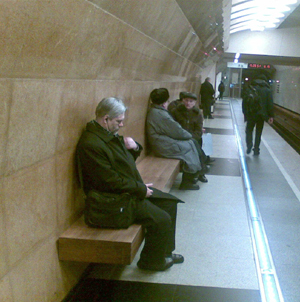 Its first stations, an expanded Kuntsevskaya and Strogino opened in January 2008, and Slavyansky Bulvar followed them in September. Myakinino, Volokolamskaya and Mitino are most recent stations to be opened. They were opened on 26 December 2009. The system operates according to an enhanced spoke-hub distribution paradigm, with most rail lines running between central Moscow and its suburbs. The Koltsevaya (Circular) line forms a circular ring that connects the spokes and facilitates passenger movements between lines without having to travel all the way into the central city. Each line is identified by an alphanumeric index (usually consisting of just a number), a name, and a colour. 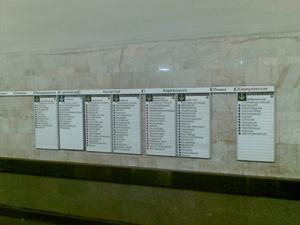 The voice announcements refer to lines by name, while in colloquial usage they are mostly referred to by colour, except the Kakhovskaya Line (number 11) which has been assigned shade of green similar to that of the Zamoskvoretskaya Line (number 2), Koltsevaya Line (number 5) and Butovskaya Line (number L1). Most lines run radially through the city, except the Koltsevaya Line (number 5), which is a 20-km-long ring connecting all the radial lines and a few smaller lines outside. On all lines, travellers can determine the direction of the train by the gender of the announcer: on the ring line, a male voice indicates clockwise travel, and a female voice counter-clockwise. 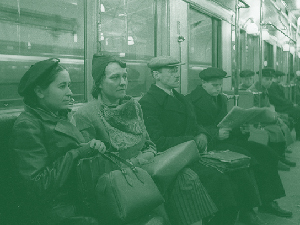 On the radial lines, travellers heading toward the centre of Moscow will hear male-voiced announcements, and travellers heading away will hear female-voiced announcements. In addition, there is an abundance of signs showing all the stations that can be reached in a given direction. The system was built almost entirely underground, although some lines (numbers 1, 2 and 4) cross the Moskva River, while line number 1 also crosses the Yauza River by bridge. Fewer than 10% of the stations are at or above the surface level. The surface sections of the Metro include the western part of Filyovskaya Line continuing as Arbatsko-Pokrovskaya Line between Kievskaya and Molodyozhnaya (eight surface stations), and the Butovskaya Light Metro Line (L1) with 4 elevated stations. The other surface stations are Vykhino, Izmaylovskaya and Vorobyovy Gory (the latter is unique in the world being built into a lower level of a bridge). There are several short surface stretches, including those between the stations Avtozavodskaya and Kolomenskaya (where a new station Technopark is going to be built), and between Tekstilshchiki and Volgogradsky Prospekt. In the Soviet time, the cost of a single journey was 5 kopecks (1/20 of Soviet ruble). The cost of journeys has been steadily rising since 1991. Inflation caused the price to rise considerably to 26 Russian rubles per trip. 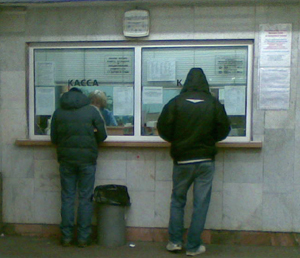 Tickets are sold only at manned booths within the stations named "kassa". In several stations there are tickets vending machines. The Metro is open from 5:30AM - 1AM. Stations close at 1AM so your journey must be completed by then (more precisely, at 1AM the last train starts from the end stations, the entrances and transfers between lines are locked and the escalators are stopped - if you caught the train, you'll be able to exit at any stop on the way, but it might be a long slog up the steps). Before 7AM and after 9PM, the metro is rarely busy. During rush hours, trains run roughly every 90 seconds on most lines. At other times during the day, they run about every two to three and a half minutes, and every six to ten minutes late at night. As trains are so frequent, there is no timetable available to passengers. Between these times on work days it can be a real squeeze, especially within the ring. 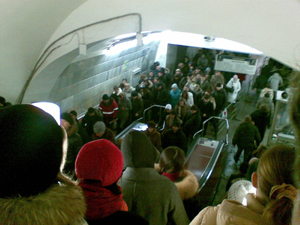 Some escalators are a two minute ride as the stations in the city center are very deep. On the escalators stand on the right. It's important to know that colors in the underground's signs don't necessarily correspond to the ones on the maps, so the green line is not necessarily indicated by a green sign (that could be the sign for the gray line). It's less confusing to refer to the numbers, e.g. line 3 is line 3 whatever color is on the sign. There are no English signs inside so have your itinerary ready beforehand or learn to read Cyrillic, which is possible. 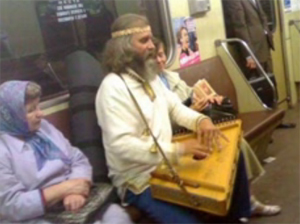 Anyway, you can use a Russian-English plan while you moving inside a Metro train. Don't let yourself be intimidated by the huge masses of jostling, rushing, cross people. The Russians also take their time to study the tiny signposts to see where to change trains or which exit to take. Don't use the metro if you are claustrophobic as the air is thick especially at rush hour. TRANSFER IS CLOSED AT 1 A.M.
Beside the underground lines there are two overground branches. First of them is so called Lifht Metro. It is represented by the Butovskaya Line, which essentially continues the Serpukhovsky radius of the Serpukhovsko-Timiryazevskaya Line. For convenience, the first 1.8 kilometres (1 1⁄8 mi) were bored in a tunnel allowing for a convenient transfer with the terminus of the main line, Bulvar Dmitriya Donskogo. For the rest of its length it follows a flyover, guarded by a sound barrier, with both single and dual tracks. Currently, four Light Metro stations, each of identical design, are in operation. 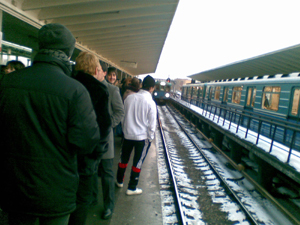 The system was opened in December 2003. The second is a short monorail line, operated by the Moscow Metro company. The line connects station near Timiryazevskaya Metro station and station near tram depot at Sergeya Eyzenshteyna str., close to AREC. 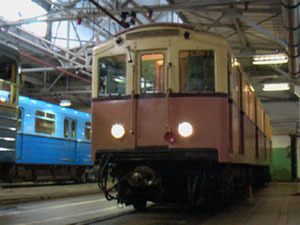 The line opened in 2004. Each line of the Moscow Metro is identified by a number (with the exception of the Butovskaya Light Metro Line), a name and a color. 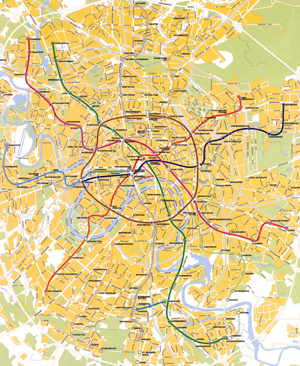 Most lines run radially through the city, except for the Koltsevaya Line (number 5), which is a ring connecting all the radial lines and a few smaller lines outside. The system was built almost entirely underground, with less than 10 percent of the stations being at or above the surface level. If you need any help, you can use an emergency column in the centre of the hall. It is necessary to prepare to exit just after the starting from the previous station. The inscription "Не прислоняться" means "Do not lean". Having looked at these boards, you can define, where is your train go and where you should change on other line. Êîìàíäà NEXXT ïðåäëàãàåò îñíàùåíèå ïîä êëþ÷ äëÿ ðåñòîðàíîâ ñ 1996 ãîäà.